The Kate Sharpley Library are sad to report the death of John Taylor Caldwell, veteran Glasgow anarchist and comrade and biographer of Guy Aldred. This kind of anarchism is assumed to have become extinct during the inter-War period, crushed between the pincers of the Parliamentary Labour Party and the Communist Party. But in a few places, notably Glasgow, it continued to flourish, thanks to individuals like John and his mentor, Guy Aldred. Aldred was the main organiser and theoretician of this movement. John's first encounter with him at the Glasgow May Day demonstration in 1934 left such a deep impression on him that later in the year he joined Aldred's United Socialist Movement (USM). In 1938, John left his seafaring employment to work, full time but unpaid, for Aldred's movement. For almost three decades he devoted himself to printing the movement's paper The Word (plus a veritable mountain of pamphlets) and turned his hand to whatever needed doing. The USM took an important part in all the political actions of its time, from support of the Spanish revolutionary cause in 1936-8, through the anti-war struggles of 1939-45 (in which John himself was a conscientious objector), and on to the anti-militarist and peace campaigns of the Fifties and Sixties. All this was achieved against a background of ever-present poverty, with barely enough money to eat, never mind provide meeting rooms or publish its propaganda. The most intense period of activity was undoubtedly 1936-38 in support of the Spanish revolutionary cause. 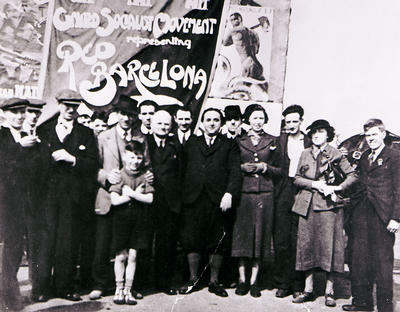 Meeting were held every night and funds had to be raised to send two comrades (Ethel MacDonald and Jenny Patrick) to Spain. But the group was in desperate need of a printing press. Amazingly, Aldred persuaded a "Roneo" salesman to let them have a duplicator on approval, which was immediately pressed into service to produce a broadsheet, Regeneracion, giving uncensored news from Spain. . When the meeting was over the chairs were replaced and the audience meandered upstairs where books were bought and fresh arguments broke out amongst small groups. The old man was tired… but he was loth to hurry them away. Some, he knew, went home to misery and loneliness. The evening in the old cellar was a rare feast of companionship for them. And for the few young ones it was good too. Not just a case of agreeing with the old master, but a challenge to read and, most importantly, to think for themselves. In the post-war period Aldred was a candidate in a number of General Elections and by-elections – not in the hope or expectation of being elected, but purely as a propaganda exercise, a cost-effective way "to expose the farcical and false nature of parliamentarism," as John put it. In all of these, John acted as Aldred's election agent, handling key aspects of the campaigns from organising the nocturnal squads of bill-posters and street-chalkers to booking meeting-halls to printing and delivering 10,000 handbills and election addresses. Despite this frenzy of activity, in Aldred's lifetime John took a background role. After Aldred's death in October 1963, however, he stepped forward to keep the movement going. Virtually single-handedly he continued to publish The Word (later transmuted to The Word Quarterly). But the USM fell into decline, and by 1968 John was forced to close its printing press and bookshop. Beyond a knowledge of the three Rs acquired in a Belfast elementary school, John was completely self-educated. He had the insatiable thirst for knowledge which until fairly recently was a characteristic feature of working class radical movements. Stimulated by the striking picture of Neanderthal Man featured in an instalment of Wells' Outline of History, he went on to read widely in history, literature, poetry, philosophy and political ideas, contributing his knowledge of these subjects to the discussion groups which were an integral part of USM activities. He was also a writer of no mean talent. Occasionally he would contribute an article for The Word, but he also wrote a series of children's stories for the Daily Mirror and The Comet. He was even invited to join the staff of Amalgamated Press but characteristically put his unpaid political work first. He had a deep love of poetry, and from his adolescence an abiding fascination with the life and work of Thomas Chatterton, but most of his own poetry remained unpublished. To some extent this may have been due to his self-effacing character. He was, as he put it, "a humble and obscure actor", and working with the domineering personality of Guy Aldred did nothing to alter this. Yet after Aldred's death his many talents blossomed. He was always ready to assist fellow workers with their research, especially if it promised to "spread the word" to new audiences and to shed new light on the movement to which he had devoted his life. Aldred's 1961 tribute to Ethel MacDonald is equally applicable to John: "…it seems rather odd that we should have the desire to struggle forward and to change the world and to put it right. Yet for some strange reason a contradiction arises within us. We do struggle, we do change the world. One generation emerges into another. The hopes of yesterday's heroes and martyrs become the inspiring slogans of the martyrs and heroes of today, and by them are passed on to the heroes and martyrs that will be tomorrow… I must be bold in mind and spirit so as to play my part in bringing about the new world in which [John Caldwell] believed, and to create which [he] toiled and struggled." John Taylor Caldwell, seaman and anarchist, born 14 July 1911; died 12 January 2007. This obituary is taken from KSL: Bulletin of the Kate Sharpley Library #49 which also includes Alfonso Failla's memories of being interned during the reign of Mussolini, the deaths of America Scarfo and Vicente Marti, news from the KSL including our new pamphlet, "Alcatraz – Uncle Sam's Devil's Island: Experiences of a Conscientious Objector in America during the First World War" by Philip Grosser and book reviews old and new.